Greenies work on building their frame looms in the shop. 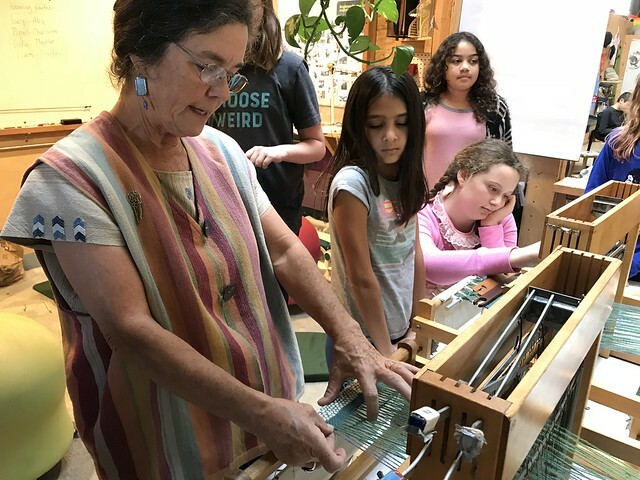 In addition to finishing up our “uniform” sewing projects, the Greenies were fortunate enough to be visited by a number of professional weavers who taught us how to use various different looms. Tien Chiu, a programer turned professional weaver and friend of Liz’s, came and shared her knowledge of weaving and showed us how to use a floor loom. Travis Meinholf, Sierra’s artist and educator friend, came in and taught a few bands how to backstrap weave, which became a favorite amongst some Greenies. Kate Colwell, a doctor and weaving teacher and friend of Piper’s family, came in to teach an exclusive lesson to the Green Band. She set up a number of table looms and a back-strap loom, and taught the kiddos how to use them and how to bind off. Kate also taught us that there are only two real rules to weaving—put on the warp hard and the weft soft. Many thanks to our weaving experts! Kate Colwell shows the Green Band how to use a table loom. Students were given cardboard looms (donated by the generous Indigo Band), on which they practiced weaving techniques. Some kids creatively used rulers as weaving swords and wooden chopsticks as shuttles. Although not the sturdiest, the cardboard looms were used to create weave after weave, with Greenies often choosing to weave during read aloud and quiet time. 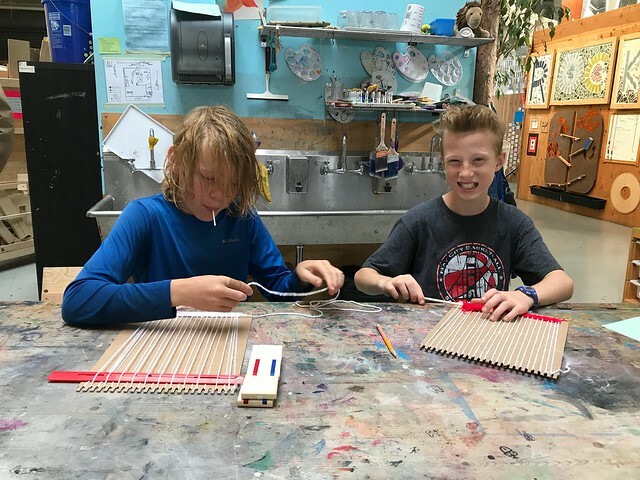 Liam and Griffin using rulers and chopsticks to weave on their cardboard looms. 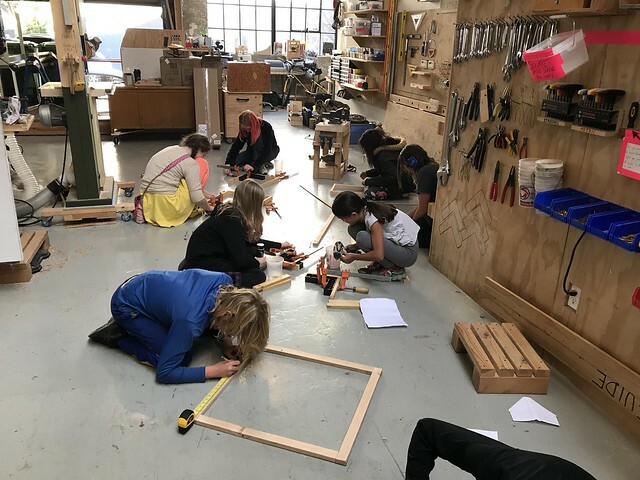 The Greenies then took their passion for [woven] fashion to the shop, where each student created a frame loom using wood, screws, and wire nails. Generally following this how-to, shop-expert Evan lead us in this endeavor. Students each made a different-sized frame loom to fit their needs, Charlotte even made a backpack to carry hers in! 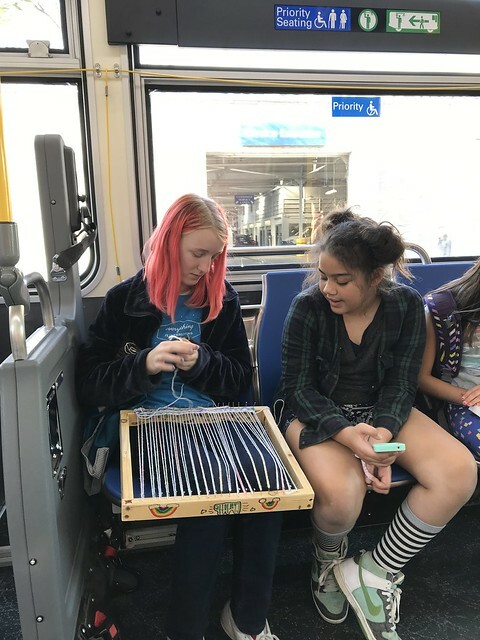 With their upgraded looms, Greenies even brought them on our field trip and wove on the bus, impressing and shocking other passengers. Charlotte, Charlotte’s loom and Aaliyah on the bus to Levi’s. This entry was posted in brightworks, Green Band. Bookmark the permalink.